This is the rambunctious story of how America came to declare independence in Philadelphia in 1776. As late as that May, the Continental Congress had no plans to break away from England. Troops under General George Washington had been fighting the British for nearly a year—yet in Philadelphia a mighty bloc known as "reconciliationists," led by the influential Pennsylvanian John Dickinson, strove to keep America part of the British Empire. But a cadre of activists—led by the mysterious Samuel Adams of Massachusetts and assisted by his nervous cousin John—plotted to bring about American independence. Their audacious secret plan proposed overturning the reconciliationist government of Pennsylvania and replacing it with pro-independence leaders. Remarkably, the adventure succeeded. The Adams coalition set in motion a startling chain of events in the Philadelphia streets, in the Continental Congress, and throughout the country that culminated in the Declaration of Independence on July 4. In Declaration William Hogeland brings to vibrant life both the day-to-day excitement and the profound importance of those nine fast-paced weeks essential to the American founding yet little known today. He depicts the strange-bedfellow alliance the Adamses formed with scruffy Philadelphia outsiders and elegant Virginia planters to demand liberty. He paints intimate portraits of key figures: John Dickinson, a patriot who found himself outmaneuvered on the losing side of history; Benjamin Franklin, the most famous man in America, engaged in and perplexed by his city’s upheavals; Samuel Adams, implacable in changing the direction of Congress; his cousin John, anxious about the democratic aspirations of their rabble-rousing Philadelphia allies; and those democratic radical organizers themselves, essential to bringing about independence, all but forgotten until now. As the patriots’ adventure gathers toward the world-changing climax of the Declaration, conflicts and ironies arise, with trenchant relevance for the most important issues confronting Americans today. 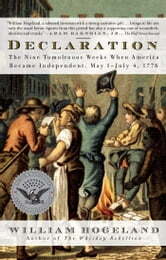 Declaration offers a fresh, gripping, and vivid portrait of the passionate men and thrilling events that gave our country birth.